Louth Old Boys Reds moved within three points of top spot after a brilliant win at East Lincs Combination Division Two leaders Chapel Swifts on Saturday. Michael Brown’s double and a strike from substitute Bailey Wright gave Reds a 3-2 win which leaves them sixth in a tightly-congested table. AFC Louth are still waiting for their first points of the season after a 4-0 home defeat to second-bottom North Cotes in a basement battle. And Alford Town also had a bad day at the office with a 8-1 defeat at Susie Stars, and slip to fifth. In Division Three, Samuel Hallett fired Louth Old Boys vets to a handsome win at Alford Town Reserves to keep them in third place. Hallett hit four goals, while Lee Jaines, Andrew Parker and Graham West were also on target in a 7-1 victory, their third in their last four matches. Fixtures – Division One: Cleethorpes Town A v Louth Old Boys. Division Two: Louth Old Boys Reds v AFC Louth. Division Three: Alford Town Res v GB Kitchens; Louth Old Boys Vets v Market Rasen Town. 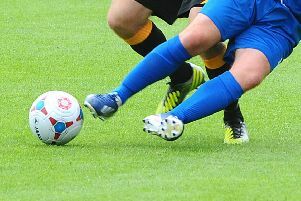 Town Trophy: Grimsby Borough Dev v Alford Town; Sutton Rovers v Barnoldby.